I have just put the engine back in the car having changed the clutch and spigot bearing. On starting the engine it seems to run OK when cold and on choke. Once the engine has warmed up it does not drop back to idle when gently taking my foot off the accelerator. The engine will stay running at up to 1500 rpm. However, if I blip the accelerator it quickly goes down to an idle speed of 650rpm. I have checked the linkage and it is not stiff. All springs are present and no more than 3 years old. My only suspicion is whether the carburettors are not operating smoothly. Prior to the clutch change the engine had not been started for 9 months. Any ideas? Sounds to me like the linkages are simply not returning to idle efficiently. the "Blip" simply gives the springs more momentum. Although the springs are new, perhaps check that all is clean so nothing is making it hard for the linkage to return properly. Have a look under the bonnet with the engine running. Raise the revs manually by hand on the linkages. Let them go back slowly so your revs stick at the 1500. Then push the linkage further closed. This will show you what's sticking. Thanks. I also suspected the linkages (which are stainless steel) but they seem OK, if a little loose. I guess I could try putting stronger return springs on the carburettors. Is the spring in the accelerator housing (4.2 cars) in good condition? As others have said disconnect the linkage at the throttle at the slave shaft and then manually slowly accelerate the engine up to 3,500 rpm and slowly back it off. If the problem is still there it is with the carbs, if not it is with the linkage. There is adjustment at the bush assembly to ensure the slave shaft is parallel and does not bind. Be wary of replacing the bush assembly (3.8 cars) with new because in my experience they don't fit! 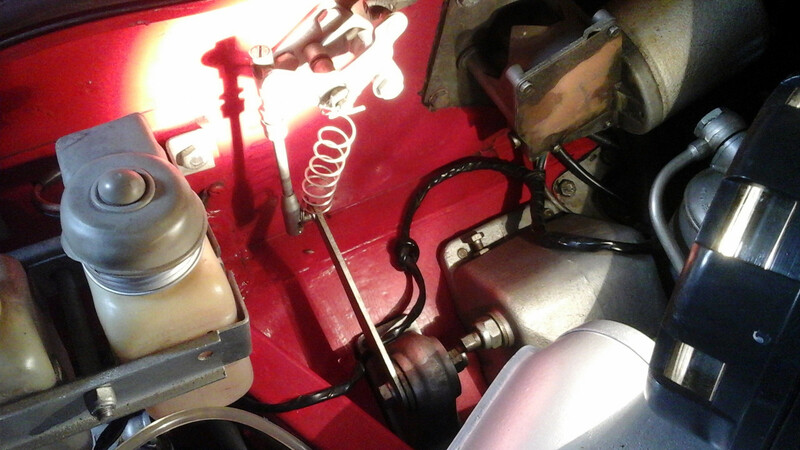 it may also be worthwhile disassembling the the linkage and cleaning all the springs, screws and ball joints. They should not be greased, just lightly oiled. And finally can you please put the series of car you have in your signature as the advice depends on that. When I had SUs and rods, I had this problem until I had the idea of setting the rods with the pedal jammed open to full throttle. In my case it allowed full movement of the mechanism and snapped the butterfly's completely shut. I also prevented me from stretching the rods a little bit every time I buried the throttle pedal with my foot, as the pedal would hit the stop before the rods got stretched. Thanks for the comments. I have read them all with interest and am trying to following the suggestions where I can. I have adjusted the bulkhead bracket holding the rod to the carburettors. Although the engine still doesn't go back to idle quickly this has definitely helped to reduce the over-revving. Will continue the tweaks tomorrow! That could be a picture from my engine bay. I ended up attaching a spring here as well. My problem was that the throttle would jam wide open, fortunately I discovered this in the garage not the open road. No amount of adjustment would stop this from happening intermittently. As Christopher has stated the 3.8 throttle linkage is prone to jamming for any number of reasons. I suspect in my case the bulkhead throttle bush was the culprit. I'd replaced the original and no amount of realignment would fully cure the problem. Coincidently my problems also started after reinstalling the engine. Just shows how little tolerence there is with the 3.8 setup. I changed suspect parts in the linkage and re- adjusted it spot-on, only to find that one of the butterflies needed a bit more force to close completely (I assisted each of the return springs one after another while engine running). Checking the carbs individually it turned out that one of the throttle shafts was a little stiff - I put a drop of thin machine oil down the shaft on each side of the gland cork seals. Worth a try, but no success in my case. I am beginning to suspect stiff carb spindle. The engine seems to enjoy sitting at 1500 rpm unless I blip the throttle. I have tried all sorts of adjustment of the linkage but without success. If I disconnect the linkage and just rev using the final link to the control arm it still sticks. I have noticed that one the carbs seems to be sticking a little and only shuts down completely if I nudge it to idle with a screwdriver blade. I will try some SU oil on it to see if that frees it a little. Have you checked the tension on the three throttle return springs? The hook onto a thin metal frame which bend easily if manhandled. I had earlier already replaced the return spring on the suspect carb but no difference. I have just retrieved the original spring that had one quite a long straight end. I cut this in half and then created a new hook using needle nose pliers. I replaced this on the carb and the idling problem was cured immediately. I can now rev to 2000 rpm and gently take my foot off the throttle and the revs drop back immediately. What would I do without this forum. Thanks to everyone!